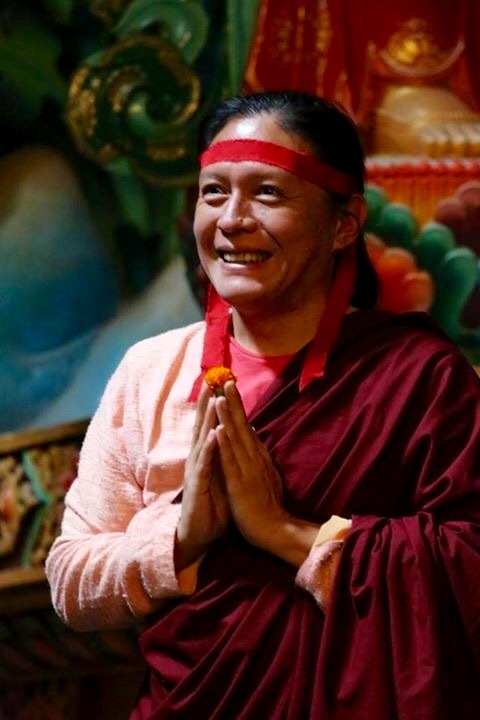 Dungsey Lhuntrul Dechen Gyurme Rinpoche was born, in keeping with Guru Rinpoche’s prophecy, in 1976 as the son of Namkha Drimed Rabjam Rinpoche and Sangyum Chime Drolkar. He was recognized as the reincarnation of Jigme Tempay Gyeltsen, the 3rd Tamdrin Lhunpo Chogtrul. He is the lineage holder for the Ripa Lineage of Vajrayana Buddhism and Abbot for Rigon Tashi Choeling monastery in Nepal. Rinpoche’s compassion and humility deeply touch the hearts of his students worldwide. In conjunction with his recognition, he was enthroned at Namdroling monastery in Mysore amidst an ocean of lamas, tulkus and monks presided over by Kyabje Drupwang Penor Rinpoche, who bestowed upon him the name Gyurme Thegchog Shedrub Tnpay Gyeltsen. At Ngagyur Nyingma College, Mysore, he completed the study and contemplation of sutra, tantra, and general liberal arts topics, and completed the full nine-year program. In the manner of a vessel filled to overflowing, from Kyabje Dilgo Kyentse Rinpoche, Kalu Rinpoche, and Kyabje Penor Rinpoche he received a sacred stream of initiations, scriptural transmissions and instructions, consisting primarily of the Great Precious Treasury of Terma (Rinchen Terdzo), and from his father he received the teachings cycle of Taksham and the Gesar mind treasures. He is widely renowned for the beneficial power of his ritual presence in the many great accomplishment and offering rites performed annually at Rigon Thupten Mindroling, the beneficial power of his command in rites for the well-being of settlement members, and the like, and also for the beneficial power of his blessing on behalf of the infirm. He currently presides over expanding his positive deeds in the domains of teaching, practicing and the ritual arts.